A Painter´s Life on Planet Goodaboom: Smaller than the bank note! Smaller than the bank note! I was back in the Street Gallery last Sunday, after 4 weeks pause forced by the police and even more by the weather. And as I told: it was a successful day! It seems that people had missed me and were happy to see me again there with all my paintings. I sold that painting, called by Kevin „The Solitary Pine“. By the way, since I have know him, he is the one who gives titles to my paintings! This is the reason why they suddenly all have English titles...I hate to do it myself, perhaps because I hate to look at my paintings when they are finished: past is past! This was the first one of a large series of miniatures I painted last year. My wise father had told me to do it, suggesting that many of my clients are older people who already have a long life behind them and have filled their house with a lot of stuff, and surely haven´t much place for a new picture on their wall! How right he was! Many clients told me the same already. And this was exactly the point with my old Norwegian lady on Sunday. She loved my art, and wanted one at any cost, but had no place on her walls. She chose the smallest one! 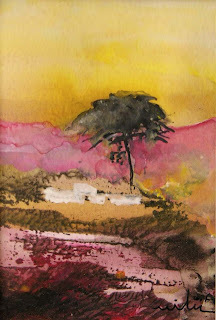 Lucky for her, I would say, as the smallest also happens to be one of my favourite landscape paintings. It was a very strange feeling, at the end, as she paid me: the note was bigger than the painting! I can tell you: this is an immense feeling of happiness, because it demonstrates so obviously that for some people, art is more important than money! So... the solitary pine will soon hang on Norwegian walls. There are already many paintings from me decorating Norwegian walls, as these folk are my best clients. Norwegian love art, and love it with a natural simplicity. When they see a painting which they like, they don´t think twice: they just buy it, wherever it is, and without even asking who painted it.